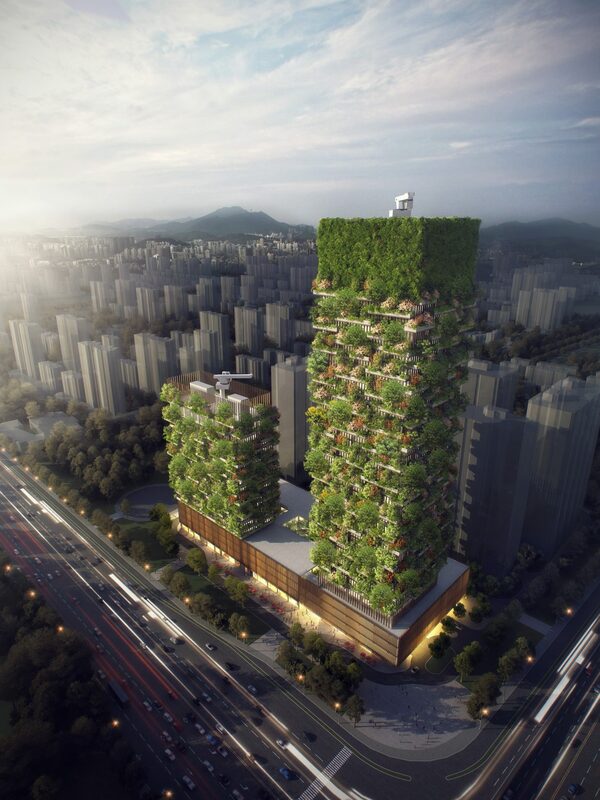 Nanjing Green Towers, designed by Stefano Boeri Architetti and promoted by Nanjing Yang Zi State-owned National Investment Group Co.ltd, will be the first Vertical Forest built in Asia. Located in Nanjing Pukou District (an area destined to lead the modernization of southern Jiangsu and the development of the Yangtze River economic zone), the two towers are characterized by the interchange of green tanks and balconies, following the prototype of Milan’s Vertical Forest. Along the facades, 600 tall trees, 500 medium-sized trees (for a total amount of 1100 trees from 23 local species) and 2500 cascading plants and shrubs will cover a 6.000 sqm area. A real vertical forest that will help to regenerate local biodiversity, will provide a 25 tons of CO2 absorption each year and will produce about 60 kg of oxygen per day.